The Aurora Bearing product line features over twenty different series of rod ends in inch, or imperial dimensions. 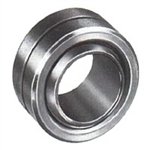 Aurora MM-6 Rod End, Right Hand, 3/8 X 3/8-24"
AUR-COM-12T Spherical Bearing with PTFE liner with a radial static load capacity of 31,920 pounds. Aurora MB-10T Rod End, General Purpose - Precision, Left Male Thread .